If you want your customers to committing to you, immediately and for a long period of time. You need to be in touch with them all of your live. Or you can choose to reach your customers per smartphone. Smartphones have become our digital companions. Over 30 million Germans swear to their small jack of trades and the trend is till rising. Now you can also benefit from this development. 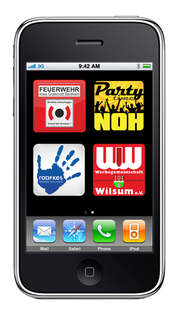 With your own application you are always present with your customers on their mobile screen. And that’s not all. As soon as you are trying to communicate. the phone strarts to vibrate in the customers pocket. By means of push-message service your customers will always be aware of the latest developments within your company. Never had it been this simple to transfer news to people who are actually interested. Always. Everywhere, and without any waste. But that is by far not all. Each app can be expanded. Run your own online web shop, make your own booking button for catering or make sure that with a push on a button you can bet on your favourite Bundesliga team. These are merely a few of the endless possibilities that the app presents which we are offering. By applying different marketing techniques it is possible to show suppliers and partners in the app. This makes the app a unique marketing platform and offers possibilities to profit economically.